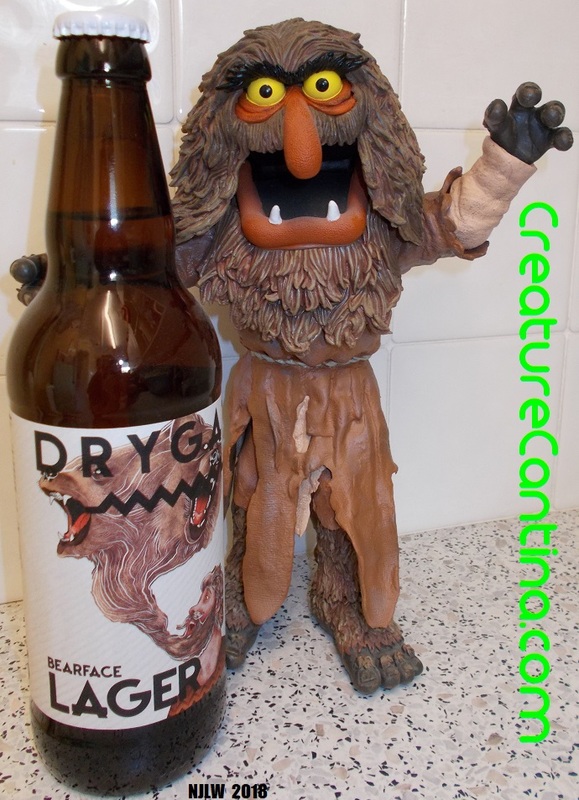 I’ve had a few beverages from the Drygate Brewing Company of Glasgow, all of which I’ve liked, but I could only find an action figure partner for one other of their products: Disco Forklift Truck. Yeah. The weird names they give their beers make it kind of difficult to match them up. At 4.4% ABV, Bearface Lager is not very strong, but that’s usually less important to me than the taste. And the label has loads of hype-building blurbs on it, in all caps, and I quote verbatim: “BREWED FEARLESSLY” “OPEN DOORS. OPEN MINDS. WHATEVER IT TAKES, IT’S ALL ABOUT EXCEPTIONAL BEER. BREW IT, DRINK IT, SHARE IT.” “OUR JOURNEY OF DISCOVERY BEGINS HERE.” “ACHIEVE THE EXCEPTIONAL.” “HEAVY ON THE HOPS LIGHT ON THE TONGUE CLEAN & CRISP CITRUS HINTS LAGER THAT REFRESHES THE BODY VIGOROUS!” After all that build-up, this had better be some phenomenal beer. But before we get into that, let’s talk action figures. I’m a huge fan of the Muppets, and it was only because of lack of funds, lack of space, and the fact that they had a buttload of different hard-to-get exclusives spread all over the real world and the internet that prevented me from collecting the Palisades Muppets action figures. I had most of Wave 1, which were a present from a relationship that went sour, so I gave those away to a fellow Muppet fan at work, I bought the Mini-Muppet Snowth figurines simply to display along with Amanaman (Doot doo doo doodoo!) as a gag, but I did manage to bag this Sweetums on clearance on BBTS a while back. There aren’t many Muppet characters I dislike (except for Miss Piggy, for too many reasons to go into right now), but Sweetums is one of my favourites. He’s just a big, friendly, mean-looking lunkhead with a slightly twisted sense of humour. I can identify with that. And this action figure of him is pretty darned good. He’s got a movable jaw and an articulated unibrow, for Pete’s sake! It’s just a shame the rest of his considerable articulation is hampered by his sculpt. And one of his legs is much longer than the other, which necessitates some awkward posing to get him not to lean like a certain building in a certain Italian town. But other than those issues, he’s huge and he looks great. Now, I can’t tell if this beer is supposed to be celebrating bearded guys in general, or lumbersexual / man-bun types, or big gay guys, or what. Is the name meant to be a pun on “bare-faced lair”? I don’t know. These are the same people who named a mango-flavoured beer “Disco Forklift Truck.” It’s too late in the evening and I’m in too much discomfort to try to figure it out, so I decided to go ahead and drink this beer to mellow out a bit. So now that I’m actually drinking it, what’s the verdict? Bearface Lager is nicely malty with a slight citrus twinge at the end of a swallow. For all self-aggrandising motivational-poster sound bites on the label, this is “merely” a very good beer. It’s richer than most other lagers, but not as rich as a lot of ales. It’s roughly average strength, but not watery. It’s tasty, but doesn’t flavour-blast your tongue. It’s too hoppy to be really smooth, and too malty to be a dank juice-bomb, brah. At half a liter and delicious, it’s just like Sweetums: big and likeable. I would happily buy and drink it again, but it’s not shooting to the top of my favourites list any time soon. So, yeah, it’s definitely worth a try. Drink this if you also like: Lagers, malty beers, brown ales.